Sweater-c/o Hallelu, Top- Equipment, Jeans-c/o James Jeans, Bag- Zara, Shoes- Zara, Sunglasses-Ray-Bans, Necklace-c/o Sorrelli, Lipstick-Revlon "Hot Coral"
Sometimes I have an outfit all planned out but when it comes time to wear it I'm totally not feeling it. That's what happened to me on my fourth day at fashion week. I didn't want to wear jeans while I was there but my suitcase wasn't agreeing with me. I scrambled around like a maniac and decided to wear jeans with a chunky sweater and my favorite Equipment blouse. My matching lipstick was an accident but I ended up liking my bold red look. there is nothing to say more..
You look fab, Taylor! I love that pretty red knit sweater. that red is stunning on you love!! and the floral top peeking underneath is gooorgeous. love this look! I love when that happens, you scramble to find something in your suitcase, and happily, it all comes together. I just moved from San Fran to Paris and was living out of my suitcase for a month before my shipment arrived. I don't think I can even look at what I packed in that suitcase ever again. Regardless, you look amazing and this is my favorite outfit of yours at FW. Now FW Paris! i love this! different from what i thought you might wear, but the red jumper really looks fantastic on you! Love this! The jumper with that shirt is beautiful. What a fabulous knit- perfect with the red lippy! LOVE the red jumper over the floral shirt! You look amazing!! I love how your floral blouse plays peek-a-boo. Looking lovely, girl! I feel like I would have a nervous breakdown trying to pack for NYFW - so much pressure! You look fabulous, of course :) Your wardrobe mishap turned into a fabulous look! This is a great outfit. And it surely does not look like something you pulled together at the last minute. I love the flowery blouse peeking under the bold red. It's a nice hint of a print. i love the vibrant color! and it looks so darn cozy! I love the red sweater paired with the bold red lips! 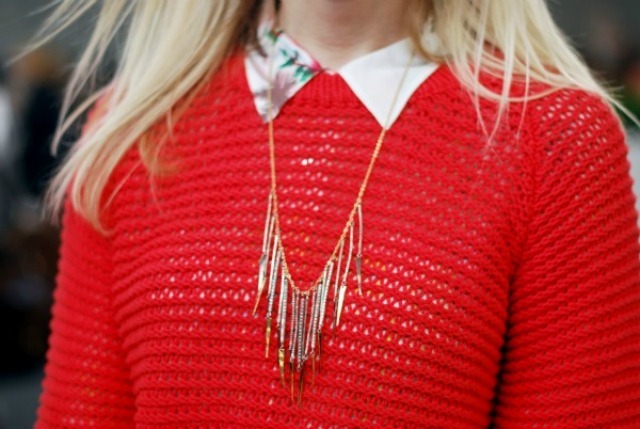 perfect layering, love the red sweater! Perfect way to bring the summer shirt into fall! OMG!This sweater is SO so gorgeous with a hint of flowers!!!! I love the lipstick and the sweater combination. You did well randomly choosing an outfit. I almost never wear exactly what I've planned to wear. Happy accidents! I do agree sometimes I think of an outfit in my head or try one on and when it comes time to wearing it I hate it!Fashion Week would be very intimidating since everyone around u is on trend! You look fab in this regardless!! Sometimes outfits look better in our heads but this one you came up with is perfect! Love the bright red and the floral peeking out! I tend to wear red when I am feeling sassy...but I should pull it on when I am having a so-so day to liven up my mood! You look great! I love the look. Funny how things turn out unexpectedly for the better. I love the bold red, looks good on your skintone! Taylor, you always look so perfect put together and chic! I love this outfit. This is my favorite look yet for your NYFW trip! Great color combination; you look polished but comfortable. Love your blouse and sweater combo! You can pull off bold colors so well! For not trying to look stylish, you look ravishing in this outfit. I love the blouse you are wearing under the red sweater! Love this sweater!! Been collecting them for fall and just waiting for temperatures to drop!!! Check out my jewelry giveaway!!! Lady in red!!! nice outfit!!! I have such a love/hate relationship with the color red...right now i'm lovin it though! You look gorgeous!! I love chunky knits in bold colors this fall!! You look great! I can never stick to a planned outfit, hence I plan multiple outfits, resulting in serious overpacking. I'm glad you found an outfit that you loved for Day 4 of Fashion Week. Wish I could pull off the bold red lips like you! Love that sweater and necklace!!!! I love the hints of floral and leopard print together! leopard with bold red is one of my favorites! Aw, Taylor I think this came together perfectly!! I love this sweater, especially layered over this pretty blouse! Polished and laid back, you are looking just lovely! xo! That bag is taunting me... I love it and want it, but not avail on line. Boo. Everything about this is a great look. The shoes, the sweater, and especially the sunglasses! I think you look fabulous! SUCH an amazing sweater. I absolutely love the vibrant color. Gorgeous as always. i love the bold red look! This is just the cutest outfit and suits you so well. Very classy. I just wanted to say that I adore your blog SO much! I've been following you from the beginning and you are probably one of my favorite bloggers of all time, if not my favorite. =) Your blog sends off such a positive, uplifting vibe and your style is so relate-able. I really do enjoy reading your posts everyday and I always find something to inspire me. Thanks for having the best blog ever! Such a classy outfit! Loving that bag. I have read your posts from this week one by one, you look fantastic in every picture! I hope you had a great time! Definitely my favorite of your outfits. I LOVE that red sweater.